Instantly Get Your Side By Side Comparison! With more than 50 providers to choose from, finding an affordable leased line was never easier. 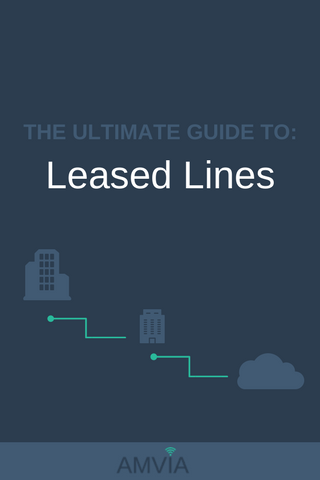 The award winning experts at Amvia have compiled the complete business guide to leased lines. 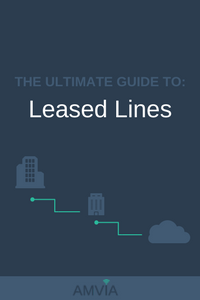 This guide covers how they work, how much they cost, what factors impact cost, the best leased line providers, which providers have the shortest and longest lead times, the most reliable networks, coverage and much, much, more. If you wish you can navigate to the relevant sections using the shortcuts below. 1. What Is A Leased Line? 5. What Speeds Are Possible? 7. How Much Does A BT Line Cost? 8. How Much Does A 100 Mb Line Cost? 9. How Much Does A 1 Gb Line Cost? 12. Do I Need One? 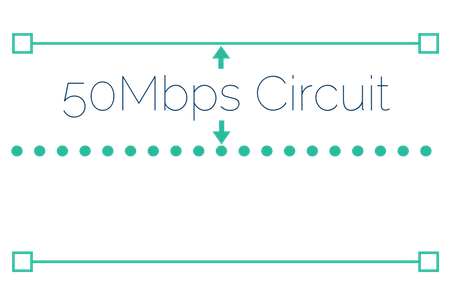 Put simply, it is a fibre data circuit, that connects 2 or more locations, for a monthly rental charge. A leased line is a dedicated service, so your business does not share the bandwidth with other businesses. The bandwidth is symmetric, which means you get the same upload and download speed e.g. 50Mbps upload & 50Mbps download. The service operates over fibre optic lines which means you can get speeds in excess of 10Gbps to support your business demands. They work by connecting 2 specified locations over a private circuit allowing data communication. The fibre is routed from the carrier's network to the nearest point of presence (PoP) and then delivered via dedicated fibre to your business location, this is called the termination point. The advantages are that it is dedicated, symmetric, fast and backed by guarantees. The line is dedicated to your business and you don't share the bandwidth. You get the same upload and download speed great for file sharing, VoIP and cloud applications. You are not restricted by the speed available, in fact you can get over 10Gbps if your business needs it. You'll also get a service level agreement (SLA) guaranteeing speed, availability, packet-loss and jitter. Dedicated means that the service is not shared. Some other broadband services are shared and slow down at busy times e.g. lunchtime. A dedicated service does not slow down if other businesses are using the leased line internet access excessively. You may have heard the phrase un-contended. This is a technical term which means dedicated too. The line is for your use only, it's a bit like having your own road to work which you can be sure won't have any traffic at rush hour. Symmetric means that the service has the same upload and download speed. For example 100 Mbps upload / 100 Mbps download. 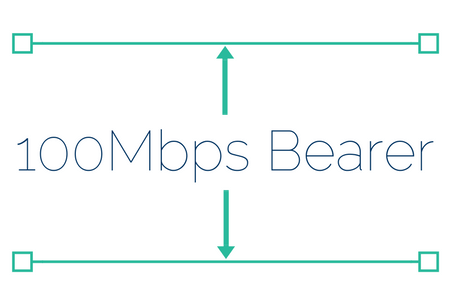 Other broadband services have asymmetric properties which means the upload and download speeds are different. For example FTTP can have 80 Mbps download / 20 Mbps upload. Symmetric bandwidth can be very useful because you can upload as fast as you can download. This means it will speed up cloud applications such as CRM, make sending large files faster, and improve VoIP call quality. 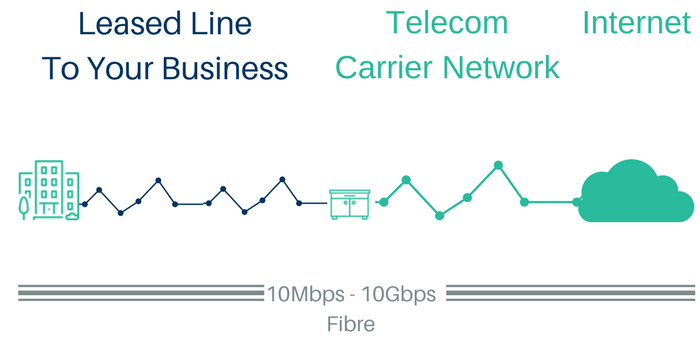 Fibre lines are the fastest business broadband service you can buy. If you can afford it you can get speeds in excess of 10 gigabits per second (Gbps) or 10,000 Mbps! Add to the high speed the dedicated bandwidth. This means that if you order 1 Gbps you will get 1Gbps of dedicated upload and download bandwidth for your business' sole use. Compare this with other shared broadband services which range from 10 Mbps to 300 Mbps download and 2Mbps to 30Mbps upload. You can see that there is a significantly higher speed capability than other broadband services. The guarantees you get with this kind of business internet service are called service level agreements (SLA). 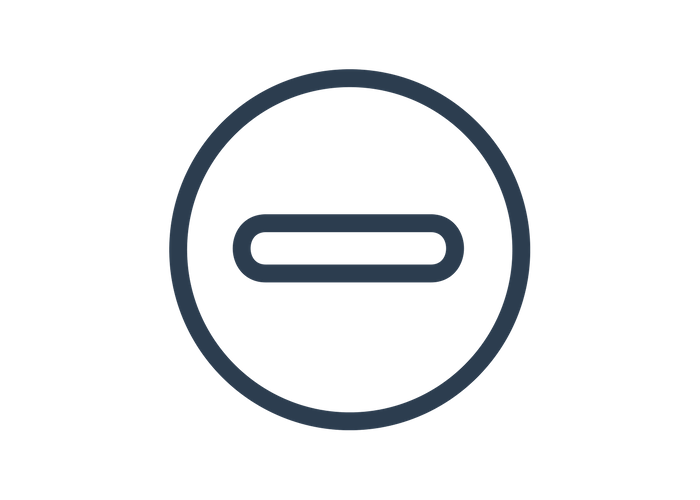 The guarantees are in the contract small print and vary from provider to provider. If guarantees are not met the telecoms provider faces financial penalties, usually called service credits. Guarantees cover speed, uptime, packet-loss, round trip time, jitter. If you're not sure what these technical terms mean don't worry we will be going into these terms and why they are important in more detail. The disadvantages are cost and flexibility. Costs range from £200/month, to in excess of £1000/month. The costs are far more than an ADSL, FTTC or FTTP connection. You'll need to commit to at least a 12 month contract and if you want to avoid installation fees a 36 month contract. The line will take between 45 -90 working days to get installed and if you need to relocate it there will be additional charges. A business may use the service to connect a single office location to the internet. Usually this is when high-speed, reliable internet access is essential to the efficient running of the business. They are also used to directly connect two business locations in a point to point network. This enables the two locations to connect their local area networks and form a high-speed wide area network. Leased lines offer the fastest fibre optic speed available. Most UK telecom providers offer up to 10Gbps. There are three main components of speed. The first element is the bearer or the size of the pipe. This is the size of the line that cannot be exceeded. It is the maximum capacity of the leased line. If a larger capacity is required, a new bearer may have to be provisioned, and it may need additional construction work. The circuit speed is a major influencer of costs. Circuit speed, also known as committed data rate (CDR), is the speed of the line that has been ordered and provisioned over the bearer. The speed is more flexible than the bearer and may be quickly increased by the leased line provider. The faster the circuit speed the higher the monthly cost. Internet bandwidth speed also impacts the monthly service charge. Internet bandwidth is provisioned over the service. It may be less than the circuit speed, but in most cases, it is the same as the circuit speed. Similarly to circuit speed the more internet bandwidth provisioned the higher the monthly cost. You can expect to pay upwards of £200/month in the UK. Costs are determined by speed, location provider brand and competition. 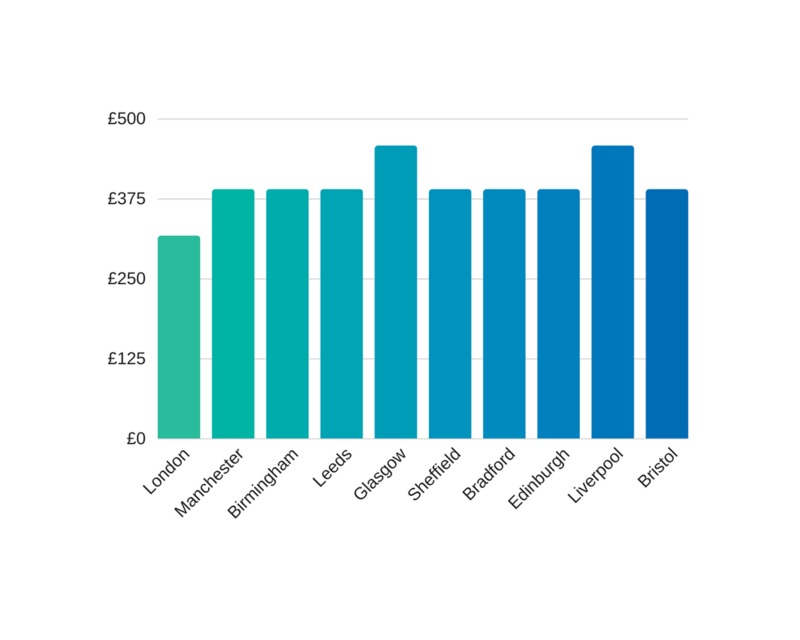 On average a leased line costs between £200/month and £400/month. 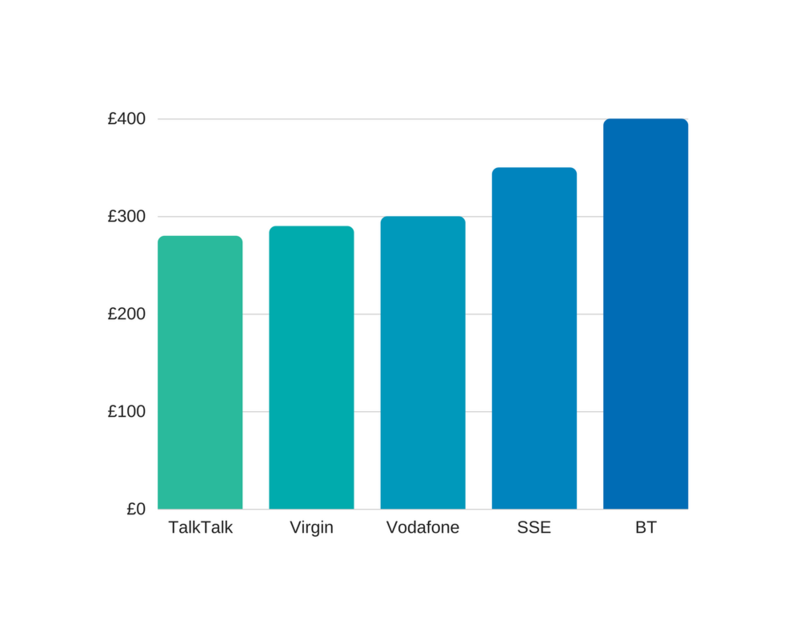 Having delivered 100s of services we've compiled a graph showing the average cost in the UK from the 5 main providers, TalkTalk, Virgin, Vodafone, SSE & BT. The faster the bearer speed the higher the price you'll pay. 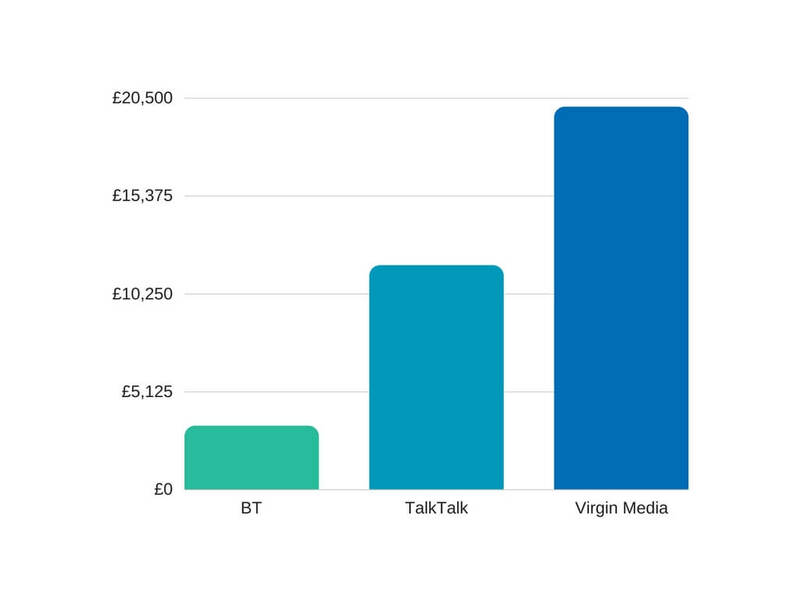 To illustrate this we took NG7 2QJ as an example and compared 2 quotes from the same provider Virgin Media. The first quote was for 100Mbps line on a 100Mbps bearer, the second quote was for a 100Mbps line on a 1Gbps bearer. The 100Mbps line with a 100Mbps bearer cost £309.84 the 100Mbps line with a 1Gbps bearer cost £362.19. 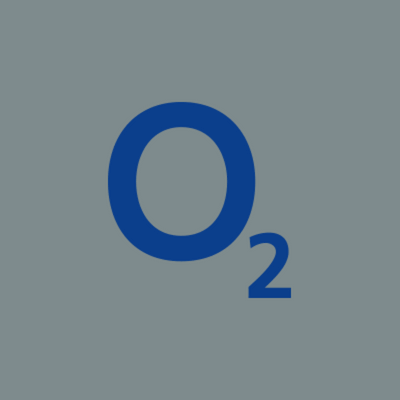 The monthly cost differential for a 1Gbps bearer was £52.35 or a price lift of 17%. The faster the circuit speed the higher the price you'll pay. To illustrate this we took NG7 2QJ as an example and compared 2 quotes from the same provider TalkTalk Business. The first quote was for 20Mbps line on a 100Mbps bearer, the second quote was for a 50Mbps line on a 100Mbps bearer. The 20Mbps line with a 100Mbps bearer cost £228.47 the 50Mbps line with a 100Mbps bearer cost £270.94. The monthly cost differential between a 20Mbps circuit speed and a 50Mbps circuit speed is £42.47 or a price lift of 18.5%. How Much Do BT Leased Lines Cost? 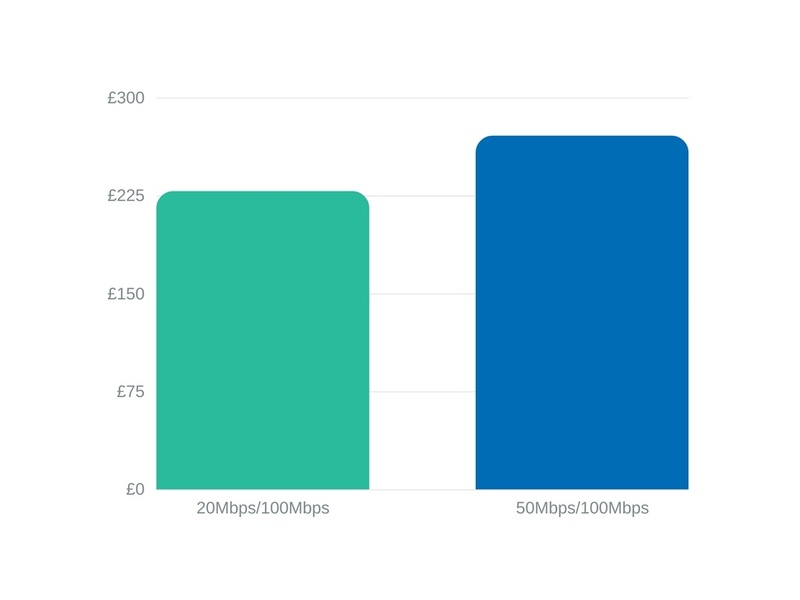 A 100 Mbps BT line costs between £300/month - £500/month in major cities throughout the UK. You can see that there are 3 price bands for a BT leased line in major cities throughout the UK. These are £317.08/month, £389.79/month and £458.02/month. If you are paying more than this you should renegotiate at the end of your contract term when you renew your service. How Much Does A 100 Mb Line Cost? A 100 Mbps service costs between £200.00/month - £300.00/month in the UK. 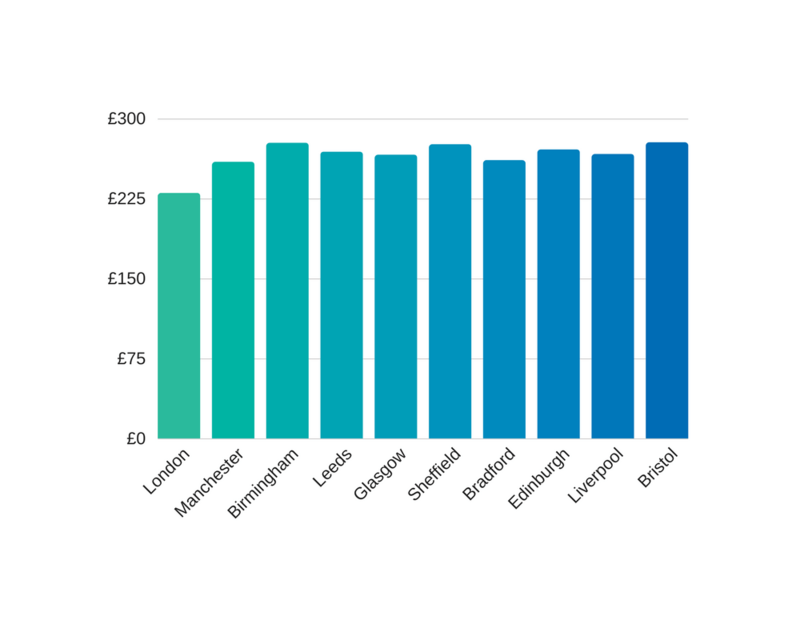 100 Mb costs don't vary much across major cities in the UK. You should be able to get a 100 Mb line on a 100 Mb bearer for around £275/month. If you are paying more than this, you should renegotiate your pricing when it comes to your renewal. How Much Does A 1 Gb Line Cost? A 1 Gb line costs between £500/month - £750/month in the UK. 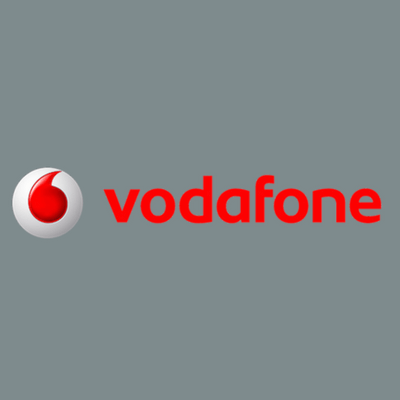 There are a number of incentives available in the UK for 1 Gb leased lines, the major one being the Gigabit Connection Voucher Scheme. Now is as good a time as ever to consider futureproofing your business with gigabit fibre broadband. Performing a comparison is proven to be the most effective way of reducing costs and ensuring you get the best deal. Did you know it is often cheaper to buy a BT service through a BT Wholesale partner than directly from BT? 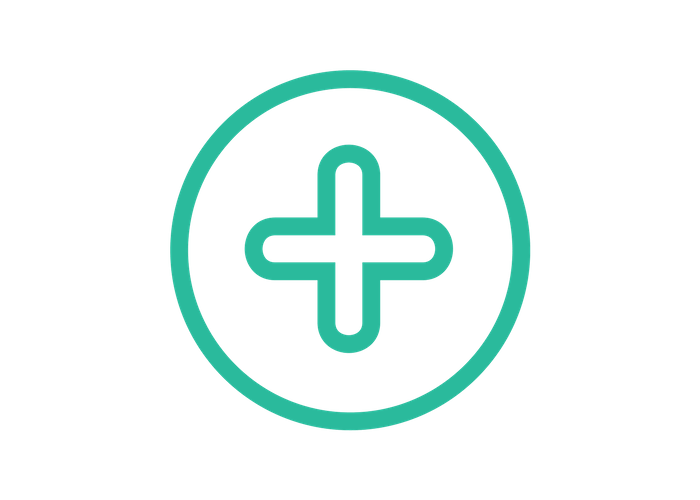 With 100s of providers in the UK, comparing providers at your location can be an arduous task. 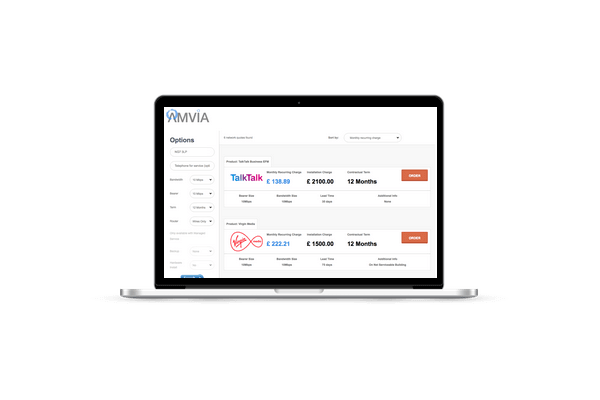 That's why Amvia built AmviaSearch™, a leased line quote tool enabling you to search all providers and get side-by-side pricing in a couple of clicks. Select The Best Provider That Meets All Of Your Needs. What are ECCs & Which Providers Have the Highest Charges? ECCs stands for excess construction charges. What do these charges mean? 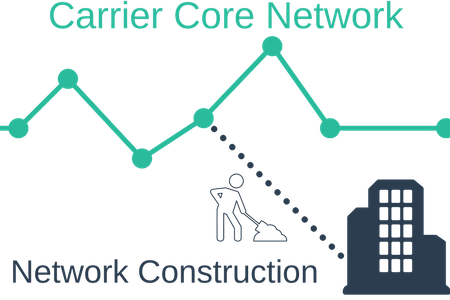 a. the carrier's fibre network has not yet been built out to the customer premises and the cost of building the fibre to the business is more than the carrier has provisioned, i.e. it's a long way. 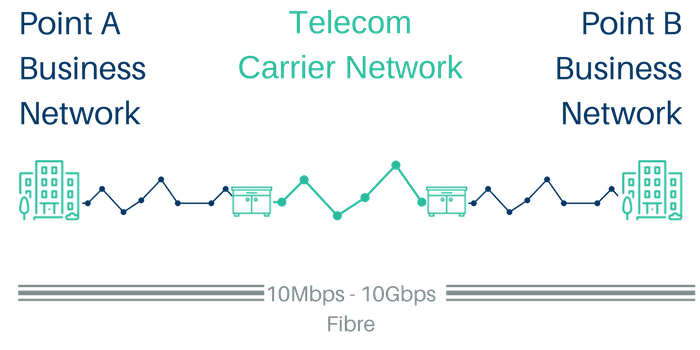 b. the carrier's fibre network has not yet been built out to the customer premises, and the carrier does not deem that the customer location is a good fit commercially, i.e. it's remote. Some carriers tend to issue ECC charges more than other carriers. 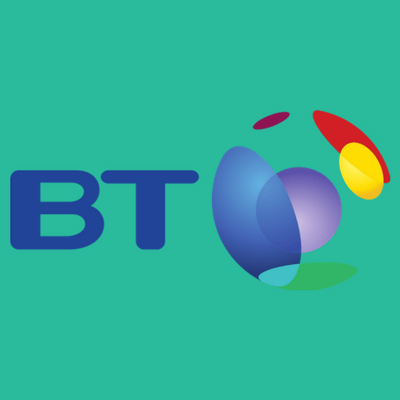 BT, for example, has a standard "build" budget included in the installation charge for it's Ethernet Access Direct services. BT also has the largest network reach and the lowest likelihood of ECC charges. So which leased line providers are the best for avoiding ECC charges? Do I Need One & How Would I Know? If you have a large number of staff, or your business would stop without internet access it is likely the increased cost of a fibre line is worth it. Fibre is more expensive than broadband or FTTC, but the bandwidth availability SLA and guaranteed fix times in the event of a failure are very valuable. Often the cost of an outage far outweigh the increased cost of fibre. If your business relies on transferring large amounts of data you may also require more bandwidth than broadband can offer. Design agencies, architects, medical professionals and engineers often need to access and send large files. Additionally businesses using VoIP and cloud applications also have large transfer requirements. If you transfer lots of data you may need the speed of a fibre line. If you are dependent on VoIP, the service level agreements that cover jitter, packet loss and round trip time guarantee the bandwidth quality needed to run VoIP applications efficiently. Additionally, in the event of an outage, you will lose voice and data services. For these reasons the additional cost is worth it due to the enhanced benefits associated with the SLA. Some businesses need more speed to operate efficiently. Sometimes the location of your business means that there is a long distance to the carrier network. Geographic factors can result in inferior DSL, FTTC and EFM performance and slow speed. You may have a remote location with limited broadband speed. 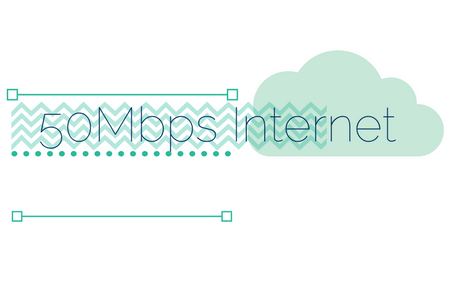 You may have outgrown your existing broadband and need to upgrade to 100Mbps or 1Gbps fibre. A fibre circuit futureproofs your business and offers you as much speed as you can afford. Which Providers Have The Best SLA? Service level agreements or SLAs are the contractual guarantees that you receive with your service. SLA guarantees cover availability, fix time, speed, performance factors such as packet loss, jitter, throughput and round-trip time. In the section below we cover the 4 largest UK providers and compare the SLA agreements they offer to their customers. SLA ranges from Singlehomed (Ethernet Lite or Multi Tenant) 99.85%, Singlehomed (Ethernet) 99.90%, Resilient 100.00% - if Virgin fail to meet these availability guarantees they allow you to claim up to 10% of the monthly service charge. If there’s a fault, Virgin aim to fix it within six hours (nine hours if it’s Ethernet Lite or Multi Tenant). 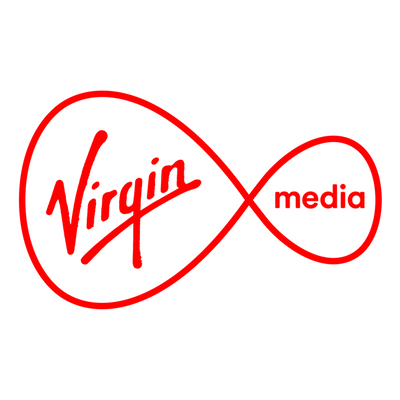 If Virgin don't fix it you can claim as follows: 0-3 Hours past 10% of monthly rental; 3-10 Hours past 20% of monthly rental; >10 Hours past additional 5% monthly rental for every additional 1 hours. BT has a target availability of 100%. 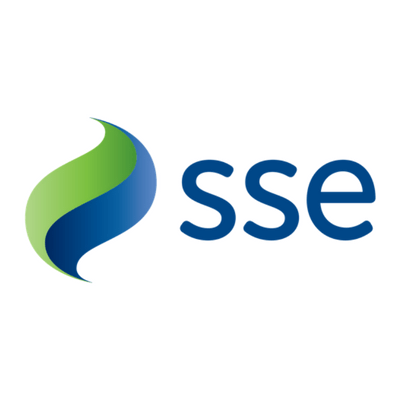 If this is not met you can claim as follows: Where the outage period is less than or equal to ten (10) hours, BT apply a reduction equivalent to one (1) day’s rental charge per hour of downtime for your service. The maximum reduction applied per quarter by BT is capped at ten (10) hours of outage. BT has a latency guarantee which is an average round-trip transmission time of 20 milliseconds (20ms) or less between BT selected core PoPs in the BT Network. TalkTalk offer a 99.995% uptime guarantee. TalkTalk offers an enhanced 5 hour fault fixing SLA for Ethernet Access Direct that's backed by service credits. 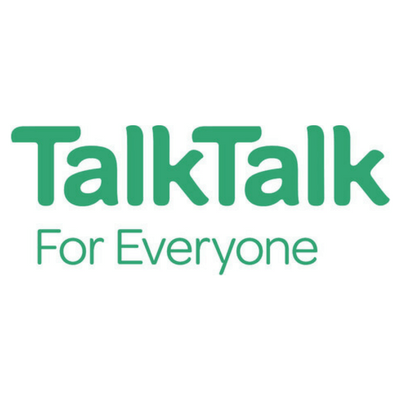 TalkTalk do not publicise the service credits available in the event of an outage lasting more than 5 hours. 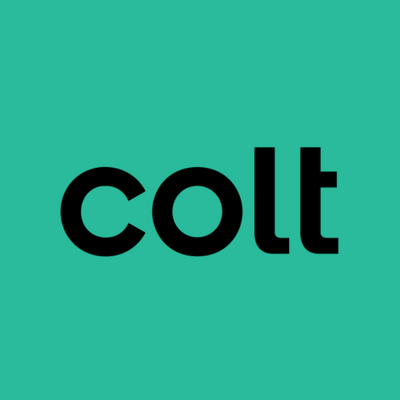 If COLT fails to maintain this availability by 0.5% then 5% of the annual rental can be claimed. The ratios for 1% are 10% compensation, 1.5% is 15% compensation and the maximum level is 2% and 20% compensation. It's complicated! COLT HSS protected on net is a 2 hour guarantee and off-net a 4 hour guarantee; COLT HSS unprotected on net is a 4 hour guarantee off-net is a 12 hour guarantee. The compensation payable for a fix time outside of SLA is as follows: Hours past guaranteed fix 0-3 hours 5% of the monthly rental; 3-4 hours 10% of the monthly rental; 4-6 hours 15% of the monthly rental; 6-8 hours 20% of the monthly rental; greater than 8 hours 25% of the monthly rental. Lead Times: How Long & Who's The Fastest? This means that if you order a fibre circuit, you can expect it to take between two and six months for delivery. 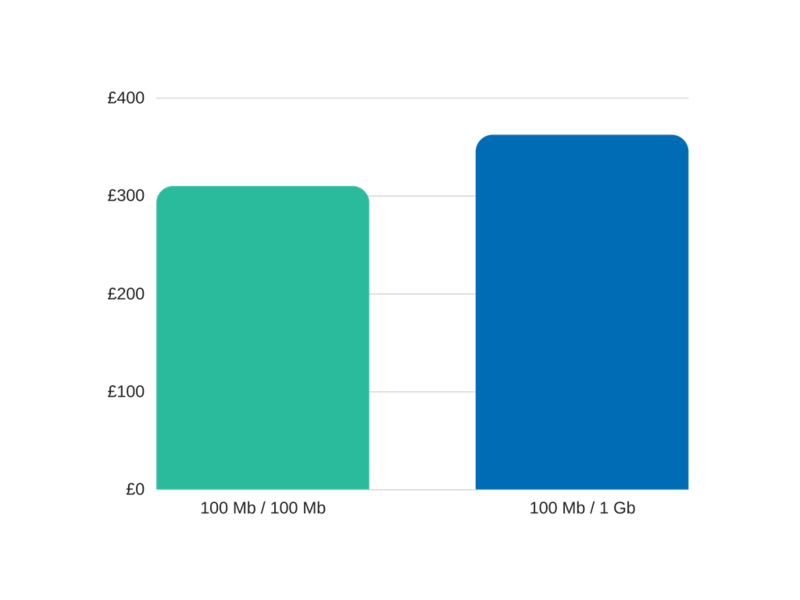 Different providers have different lead times, the graph shows you the average lead time for each carrier. 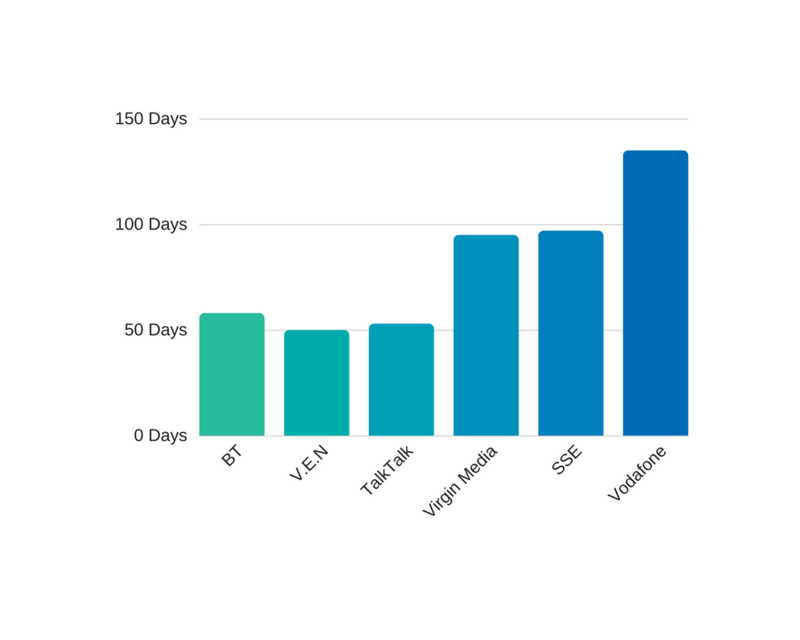 V.E.N have the lowest average lead time of 50 working days, TalkTalk are the next with 53 working days, BT deliver leased lines in an average of 58 days, Virgin Media's lead time is considerably longer at 95 working days, then SSE at 97 days and Vodafone have the worst lead times at over 135 working days. 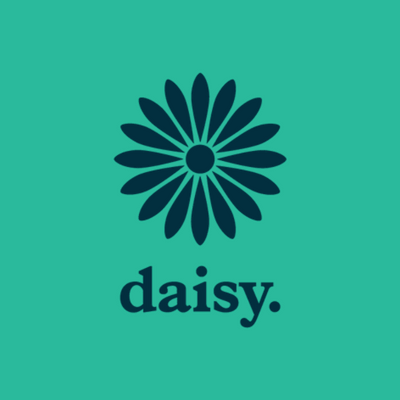 “I compared 8 providers, 6 of which I had no idea were present at our business location. We saved 34% vs buying directly from BT"